Care must be taken to ensure that the engagement and wedding rings look beautiful at the wedding. The wedding, after all, is a moment of glory for any diamond engagement ring. It represents the culmination of a couple's love into a lifelong commitment that began with a simple, hopeful question. Many brides, however, are so busy with wedding plans that they inadvertently overlook the detail of what to do with their engagement ring during the wedding. In the rush of last-minute details, it is crucial not to overlook caring for your engagement ring. A week or two before the wedding, the ring should be thoroughly inspected by a qualified jeweler to examine the setting, accent stones, and other details for any sign of weakness or damage. By taking this step quite early, there is still time for possible repairs. You do not want an unpleasant ring surprise at the wedding. This is also a good time to have the ring appraised or insured, if desired. That paperwork may be critical if an international honeymoon (including a cruise) is planned and the ring might be lost. For bridal set rings where the wedding band is designed to fit snugly around the engagement ring and provide additional accent stones to the central diamond, now is the time to have the two rings soldered together. This guarantees that they fit tightly together and prevents wiggling which could cause unnecessary scratches. Just a day or two before the ceremony, the engagement ring should be thoroughly cleaned. Dozens of pictures will be taken during the celebration, and while the rings may not always be in focus, a sparkling diamond provides a touch of glitter to any snapshot. Furthermore, most couples do insist on several close-ups of their new wedding rings, and the engagement ring should look just as spectacular. 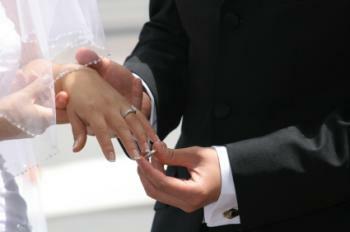 Traditionally, the wedding band is worn first on the fourth finger of the left hand, making it closest to the heart. If a bride chooses to wear her engagement ring during the ceremony, however, this can cause a problem. Many brides simply wear the engagement ring on their right hand and move it to their left unobtrusively after the wedding band is placed on their finger. Another option is to continue wearing it on the left hand but to switch the rings to the proper order immediately after the ceremony. In either case, move the rings without drawing undue attention to the act, preferably after the ceremony or on the way to the reception. For soldered bridal sets, this is not a concern because the bride does not have the option of wearing her engagement ring throughout the ceremony. Many brides prefer the classic elegance of wearing gloves with their wedding gown, but there are several things they need to consider for their engagement rings. Never wear the ring on top of the glove - it could easily fall off when the glove is removed or be too tight to remove without a struggle. If the ring is to be worn under gloves, they should fit loosely through the fingers to avoid snagging on the ring, especially if it has a high, exposed setting. A specialized ring glove is recommended, where the appropriate finger has a functional slit and can easily be manipulated to accommodate rings. After the ceremony, gloves should be removed for the meal and socializing, and to better allow guests to admire the new wedding rings. Photography is an integral part of any wedding and may be the only way the happy couple can capture every moment of the day. 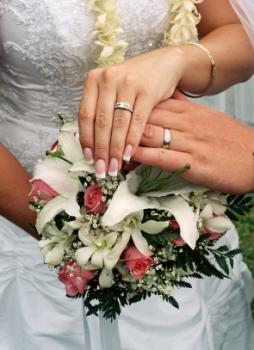 Photograph the rings by themselves, unattached to the couple. These shots include placing the rings on a wedding invitation, inside a vibrant flower, or on a significant page of a Bible or prayer book. Showing the rings on the couple's hands, including the popular shot of their intertwined hands resting on the bride's bouquet. Take a picture of just the bride's left hand holding her bouquet. Consider a shot of either partner signing the marriage license. Take a photo that highlights the rings as the couple cuts the wedding cake. Show the rings involved in the tender moments of the day, such as the bride's hand resting gently on her husband's lapel, or the groom's hand softly resting on his wife's waist. To ensure that the engagement ring (and now wedding rings), continue to look their finest throughout the celebration, it is vital to keep them clean throughout the festivities. Remove the rings when touching up makeup or hairspray. Avoid the frivolity of smashing cake into one another's faces in order to spare the agony of cleaning gobs of frosting and crumbs out of intricate prongs and settings. From pre-wedding inspections to photo opportunities, the engagement ring must be treated carefully at the wedding. After all, the glittering ring was the initial hint of a wedding and has been a focal point throughout the preparation. Just as the wedding is the culmination of the couple's relationship, the engagement ring is the glorious symbol of their commitment to one another. It should shine just as brightly as their smiles on the wedding day.